I could tell strawberry season came early this year to just about every region of North America because I got emails from so many of you from all over the continent within the same two days! You were all wondering the same things — what is pectin?, is it healthy?, is it part of a low-sugar whole food lifestyle, and can you make jam without pectin? Naturally occurring pectin is a soluble fiber found in many fruits and plants. Pectin is a great example of a natural polymer, and is composed of pectic acid and pectinic acid molecules. It is basically a compound with a bunch of sugars and acids attached to it. (I always find the chemical structure fun!) Every plant contains some amount, sometimes just a very small amount, of pectin. 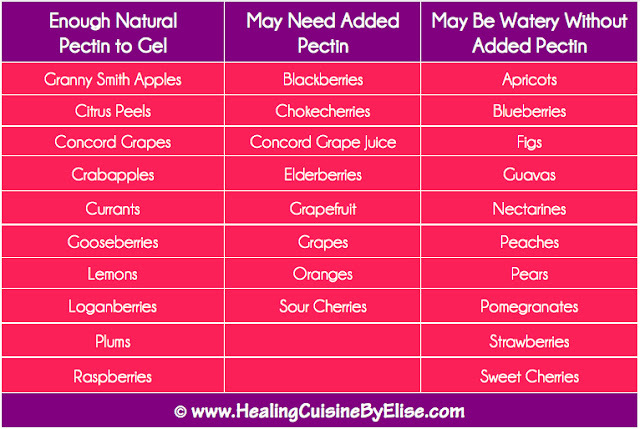 In the plant/fruit, pectin is the material that joins the plant cells together. Citrus peels contain the highest amount of pectin, followed by tart apples, citrus pulp, and carrots. When heated with more sugar and acid (often lemon juice or vinegar), pectin causes a thickening that is characteristic to jellies and jams. Like most things in today’s society, you can find pectin commercially in both natural and synthetic forms. Pectin is commonly used as a thickener in foods like jam and jelly, but you may also find it in commercial drinks, yogurt and a variety of other foods, medications, and supplements. You won’t necessarily see it on the ingredients label of a commercial product because it can be grouped under “natural flavors.” In this case, it most likely comes from unripened crab apples or turnips, but the pectin may not be pure. It can be mixed with preservatives or other chemicals to make it “work better.” You can also buy natural and/or synthetic pectin in a powder or gel form for use in homemade jams/jellies/baked goods. Yes, generally naturally occurring pectin is a healthy thing. It is a dietary fiber which the human body cannot absorb, so it passes through us. Fiber offers a lot of health benefits, such as keeping the colon healthy, preventing blood glucose spike, and reducing IBS or other intestinal health issues. Because pectin is widely used as a thickener in commercial food preparation, people often wonder how much is too much? Because it is naturally found in fruits and vegetables already, pectin consumption does not typically cause side effects. But, like you may expect, consuming too much pectin may result in stomach pain, digestive issues, or diarrhea. Over consumption of pectin may also prevent your digestive tract from absorbing your food’s nutrients. One of the biggest confusions I’ve found about pectin is what it’s purpose is in jams/jellies. A lot of folks think you need to use pectin when making homemade jam or jelly because it prolongs the preservation period. The truth is, pectin has no affect on the preservation time frame. Adding pectin to jam or jelly (or anything) only affects the gelling of the end product. It makes for a thicker, glossier spread. You can get away with making homemade jams or jellies without adding extra pectin to it. Can your jars as normal for a long shelf life, multiple years safely. Or store your jars of jam in the freezer for up to a year. Remember, all fruit naturally contains pectin. Some fruits contain more than others. (The pectin content in all fruit is also generally higher when fruit is just barely ripe and diminishes as it matures from fully ripe to overripe.) 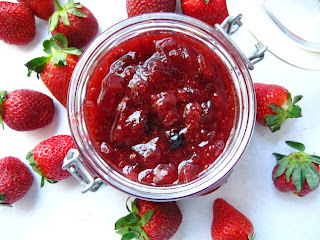 If you’re not planning to enter your jam in a county fair contest or the like, you can probably get away with a slightly runnier texture by leaving the extra pectin out. Or simply boil the jam longer to thicken it naturally by breaking down the pectin already within the fruit. That’s the old fashioned way of doing it anyway! So how does pectin fit in to our way of eating? Natural pectin is mostly fiber and bonds together with a little bit of sugar. The sugar is what allows it to gel up and set. Natural pectin that you consume in your fruit/veggies is okay on the Core Plan, but you’ll want to consume as little pectin as possible on the Advanced Plan — we already know which fruits are okay for lowest sugar content, and not to go overboard on those fruits. It’s important to watch the natural pectin intake as well, especially in the initial phase of the Advanced Plan. Pectin is essentially a complex sugar and it can aggravate your GI tract while your body goes through changes and healing. If you’re looking to use commercial pectin, you’ll have to read the ingredients closely. There is a wide range of commercially made pectins. Some contain dextrose, a chemically derived sugar from corn. Some pectin brands are “sugar-free” but you’ll note that they often contain artificial sweeteners. And many contain other fillers and chemicals. Read closely! All of these are no-no’s while following a Maximized Living or whole-food lifestyle. Personally, I don’t buy anything that uses synthetic ingredients. This includes the use of synthetic pectin or commercial pectin. While you can buy pectin in powder or gel form from the store, in my opinion it undermines the purpose of making a whole-food organic product which is free of synthetic additives at home. Even if you’re buying a pure commercial pectin, you have no idea of the toxic load from pesticides/herbicides used on the fruit it was extracted from. To most optimally stick to your Advanced or Core eating plan, you’ll want to use completely natural, and organic if possible, pectin in your jams and jellies. You can easily make homemade pectin from apples, lemons, or oranges. Or you can forgo the use of extra pectin in your recipes at all. 1.) Add the chopped (but unpeeled and uncored) apples to a large stock pot. Add enough water to cover. Add the lemon juice. Bring to a boil over High heat. 2.) Cover, reduce heat and boil for about 2 hours, or until the apples are mushy and the mixture looks like apple sauce with skins floating in it. Stir as needed to prevent sticking. 3.) Carefully strain mixture into a large bowl through a large strainer lined with doubled cheesecloth, a clean tea towel, or a jelly bag. Don’t smash or scrape the apple mixture through as you’ll get a cloudy pectin, but rather let gravity do the work and let the moisture drip through. What drips down should be almost clear liquid and slightly slimy to the touch. That is the pectin! Let it drip over night. 4.) Discard strained apple skins and bits. Return the apple liquid to the stock pot and bring to a boil for 30-40 minutes. The mixture will reduce by about a third. 4.) Pour into sanitized jars and store in fridge (7 days), freezer (1 year), or water process (1+ years). That’s it! That’s all it takes to make a truly natural, pure, organic, sugar-free pectin! How do you use it? That is the difficult question. Start by referring to the fruit pectin content chart above to get an idea of how watery the jam may be based on which fruit(s) you are working with. Then, prepare your jam/jelly and test out your homemade pectin! You’ll learn from experience! For a batch of 12 jars, start out with about half a cup. A great way to test your pectin as you get started is the ice cube test. As you finish up the first batch of jam, just when you are ready to fill the jars, remove a spoonful of the jam and hold an ice cube against the bottom of the spoon. It will take a few minutes. If the spoonful sets to your liking, you can fill the jars, seal them and store or process them to your liking. If the spoonful does not set, add bit more pectin and a splash of lemon juice, bring to a full boil for 1 minute, and test again. Continue until your jam sets to your liking. After a batch or two, you’ll get the hang of using your homemade pectin! There is one brand of commercial pectin that I found suitable for the Advanced Plan. The brand is Pomona’s Universal Pectin and you can find it here. It is a low methoxyl pectin, meaning it is sugar-free and the jelling is actually activated by calcium phosphate rather than sugar. Other pectins require the jam/jelly to be at least 55% to 85% sugar (that’s more sugar than fruit!) in order for the pectin to set. That would be too much sugar for anyone on the Advanced Plan! This type of pectin is perfect for a recipe that uses a low amount of sugar, like the natural sugar from the fruit. And this brand is made directly from citrus peels, so we know where it’s coming from. It’s not organic, but they make a truly pure product with no preservatives, no dextrose, and no artificial anything! You can sweeten your jam/jelly using xylitol or stevia if you want, but no sweetener is required to make this pectin work. I have never tried this brand personally, but if you decide you want to stick with commercial pectin, this would be the brand I would use. It seems to be the most natural and the most pure. Are you still puzzled by pectin? Did I overwhelm you? I’m feeling a little fuzzy headed as well after all this research, but let me sum it up. At the end of the day, the best way to make jam/jelly for the Advanced Plan is to not add any extra sugar or pectin at all. Make it the old fashioned way and let the natural pectin in the fruit do the work. Second best option is to drop some lemon or orange peels and a few spoonfuls of raw honey into the boiling jam and let it do what nature intended. Third best option is to make your own homemade pectin from under-ripe organic Granny Smith apples or Crabapples. 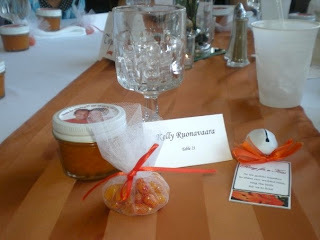 And fourth best option is to use a low-methoxyl sugar-free pectin that doesn’t require added sugar to gel. I hope we all learned something from this! Would love to hear your thoughts! I’ll be following up this post with some of my favorite jam recipes, coming at you starting Thursday and throughout the weekend!